The world's leading introduction to networking--fully updated for tomorrow's key technologies. Computer Networks, Fourth Editionis the ideal introduction to today's networks--and tomorrow's. This classic best seller has been thoroughly updated to reflect the newest and most important networking technologies with a special emphasis on wireless networking, including 802.11, Bluetooth, broadband wireless, ad hoc networks, i-mode, and WAP. But fixed networks have not been ignored either with coverage of ADSL, gigabit Ethernet, peer-to-peer networks, NAT, and MPLS. And there is lots of new material on applications, including over 60 pages on the Web, plus Internet radio, voice over IP, and video on demand.Finally, the coverage of network security has been revised and expanded to fill an entire chapter. 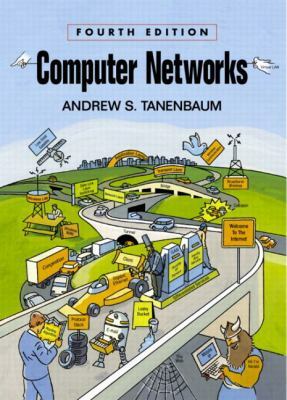 Author, educator, and researcher Andrew S. Tanenbaum, winner of the ACM Karl V. Karlstrom Outstanding Educator Award, carefully explains how networks work on the inside, from underlying hardware at the physical layer up through the top-level application layer. Tanenbaum covers all this and more: Physical layer (e.g., copper, fiber, wireless, satellites, and Internet over cable) Data link layer (e.g., protocol principles, protocol verification, HDLC, and PPP) MAC Sublayer (e.g., gigabit Ethernet, 802.11, broadband wireless, and switching) Network layer (e.g., routing algorithms, congestion control, QoS, IPv4, and IPv6) Transport layer (e.g., socket programming, UDP, TCP, RTP, and network performance) Application layer (e.g., e-mail, the Web, PHP, wireless Web, MP3, and streaming audio) Network security (e.g., AES, RSA, quantum cryptography, IPsec, and Web security) The book gives detailed descriptions of the principles associated with each layer and presents many examples drawn from the Internet and wireless networks.Tanenbaum, Andrew is the author of 'Computer Networks ', published 2002 under ISBN 9780130661029 and ISBN 0130661023.